MAINZ 05 as the name suggests were founded in 1905. Local leagues such as the Oberliga Sudwest were the norm for most of the history and they were rarely any more than a mid-table side. 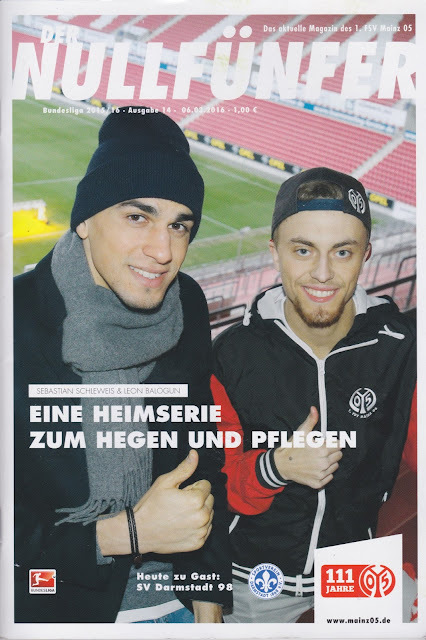 The long quest to get to the Bundesliga was finally realised in 1998 when they joined it's second tier, but they went straight back down and it wasn't until the late 1990's that they firmly established themselves at this level. Promotion to the top tier was accomplished in 2004 and they had 3 seasons before being relegated. Since 2009, they've been permanent fixtures in the top flight, with a record 5th placed finish in 2011. The club has had a few forays into Europe, the best being in 2005 when they beat Armenian side Mika Ashtarak & Keflavik of Iceland before a 1st Round defeat to eventual champions Sevilla. Well known to English fans, Jurgen Klopp was the team's manager from 2001 - 2008. When planning my time in Frankfurt, I'd not yet found a Sunday game at the time of booking my flights. However, several people recommended Mainz, and with it a reasonable distance away on the train, I decided to take the plunge and book a ticket on the very reasonably priced terrace. I couldn't hang around if I wanted to catch my flight, though there was around a 90-minute window for error should things not run perfectly. 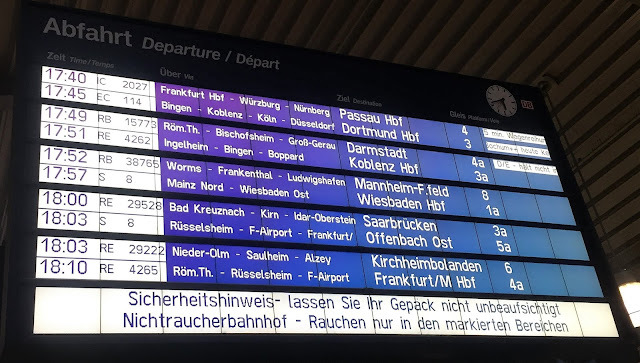 The walk back to the station from my previous game at Biebrich was easy enough although I had around a 25-minute wait for the train as they only ran every 30 minutes and I'd just missed the previous one. Though Google maps was excellent for finding out about trains it never specified what platform to use so I has to be on my toes if I didn't want to miss it. Soon enough I was on my way and the 8-minute trip got me to the main station in Mainz just after 1.30. I got the batteries I needed though sadly the Applelfwein scene was not what it was in Frankfurt so I had to go over to the Irish Rover pub and had a couple of pints of Strongbow. Then I just followed a load of Mainz fans for the excellent shuttle bus service to the ground which only took under 10 minutes. One thing I noticed on the walk up to the ground was the total lack of unofficial food, drink and merchandise sellers that had been out in force at Frankfurt. The club obviously keeps a vice-like grip on things like this and as a result, prices are jacked right up with a scarf at €15 being 3 times the price I paid at Frankfurt. So I settled on a small pennant for €5 and also bought a programme for the bargain price of €1. I noticed the rip off 'no cash' policy was out in force for the food and drink again and I wasn't going to be stung for the second day in a row. So I stayed hungry for the game which was another dull 0-0 just as my game at Offenbach Kickers was on Friday. The highlight of the game was a sending off for the Darmstadt number 2, for kicking out in retaliation to a foul. It was played in a cracking atmosphere and it was a shame that the game on the pitch did not do it justice. Especially decent was the singing of 'You'll Never Walk Alone' pre-kickoff with scarves being held up Anfield style. After the game I walked back to the shuttle bus pick up point and just as on the way, it was another impeccable service. I was back at the station with bags of time to go before my train and so peckish went in search of food. I'm not normally a fan of McDonald's in the UK but in Germany, they do the McRib and that is one thing that I like. I got that with some fries and walked back to the platform for my train before eating it. Unlike some other stations, there was no chance of going wrong with everything really well signposted. The train was delayed by 10 minutes thanks to hanging around at a station for ages, but even so I still had well over an hour to spare before my airport bus. I had my last bottle of Applelfwein and had a look around the local area before getting to the bus stop half an hour early. That time soon went and at 8, the bus left, getting to the airport 10 minutes ahead of schedule. The airport was deserted apart from the people on my flight and after passing through security there was very little to pass the time airside. Eventually, though the time came to fly and after several lengthy security checks, we were on the plane. There was another delay while they got the plane ready but there was only a 15-minute delay overall. Security at Stansted was quick for once and there was only a minimal wait for the coach. It was snowing as I got to my car and I was hoping it wouldn't ruin my plans for my week off work. As you'd expect, traffic at this time of night was minimal and I enjoyed a swift journey home, getting in at 2am. Reflecting on my few days in Germany, it had been a good but unhealthy time. I'm now a bit more confident in finding out stuff, and have learned a lot about how to get the best value and experience from the weekend, especially with regards to eating and drinking and planning flight times. I very much expect to be making a return. I've not visited much apart from football grounds and bars and there are a few tourist attractions that I'd like to visit, as well as having a proper meal. And of course, there are plenty more football clubs to visit, with hopefully better fare than the 2 goalless draws that blighted my weekend. COFACE ARENA is situated a long way away from the town of Mainz itself, however, an excellent shuttle bus provides a free and highly efficient service to get fans from the main station to the stadium. The ground itself is excellent, the best part being the large terrace behind one goal. The atmosphere is excellent, though views can be impeded if you are of short stature like myself. The capacity of 34,000 is made up mainly of seated fans, and these fans contribute to the occasion too. The programme is great value for just a euro whilst in the absence of any unofficial sellers, the club shop is expensive, though it is possible to pick up something nice for a reasonable price. The kiosks inside are pre-payment card only, which seems to be quite common. So I'd recommend that you eat and drink in town. 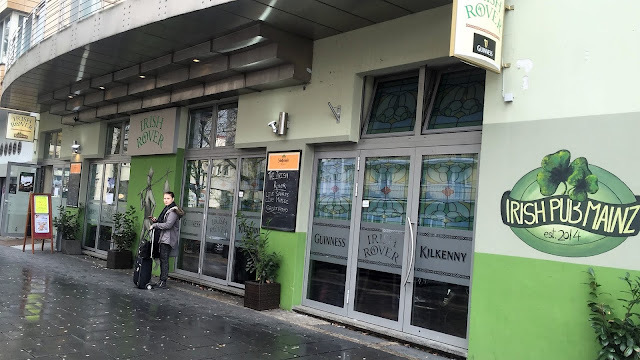 In the absence of the Appfelwein taverns of Frankfurt, I settled on a pub called the Irish Rover where the host was welcoming, there was live TV football (including English games) and they also did food should you wish to eat there. There's absolutely nothing on the approach to the ground, bar people collecting cans and bottles, another common sight in Germany.